To make croutons place bread in freezer prior to cutting into cubes. Cut each slice of bread 4 x 4 (16 cubes per slice of bread). Place cut bread cubes onto a sheet pan sprayed with butter flavored pan release spray. Spray bread with butter flavored pan release spray and sprinkle with Italian Spice Blend. Mix gently to incorporate seasoning. Toast in a preheated low-heat oven 325 F for approximately 30 - 45 minutes. Bread cubes should be dried out but not burned. After croutons have cooled, portion 1 ounce croutons in soufflé cup. See recipe MRS 1317, Croutons (Made), for detailed directions and photographs of this recipe. Place frozen chicken fillets on lined sheet pan (18" x 26" x 1"). Bake fillets according to package directions. Overcooking will cause fillets to be dry. Cover pan and refrigerate until chilled or until ready for salad assembly. CCP: Cover and refrigerate at 41 degrees F or lower. Wash cucumbers and tomatoes under cold running water, then drain. Slice tomato in wedges (8 wedges per tomato). Cover tomatoes and cucumbers and place under refrigeration until ready to build salad. Combine shredded cheeses. Weigh 1 ounce to determine amount needed for each salad. Cut the cooked chicken fillets into strips and portion 1 fillet per serving. Combine pre-washed salad mixes and place 2 cups of salad mix in salad plate (if using a 3 compartment plate, the large section). Note: If greens are not prewashed, rinse and drain thoroughly. Place 3 slices of cucumbers on top of lettuce bed on the left side. Place two wedges of tomato on top of lettuce on the right side. Place 1 broccoli floret on each side of tomato wedges (2 broccoli florets per salad). Place 1 portion of chicken on the left center of the lettuce bed. Place 1 ounce of shredded cheese on the lettuce bed. Place 1 soufflé cup of croutons and 1 1/2 ounce packet of 1000 Island salad dressing in salad plate. 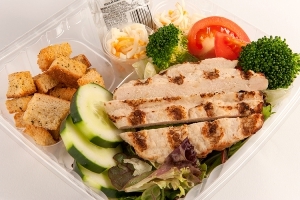 Portion 1 grilled chicken salad per serving. Each portion provides 3 oz. eq. meat/meat alternate, 1 oz. eq. whole grain, 5/8 cup dark green vegetable, 1/8 cup red/orange vegetable, and 1/2 cup other vegetable. "Culinary Techniques for Healthy School Meal" provides seasoning and serving ideas for salads. Three compartment container allowing space for the salad, dressing, and croutons is recommended. A clear plastic lid for eye appeal is preferable. Do not refrigerate croutons. When salad is ready for service, croutons should be placed in the container. Two packets of purchased croutons or 1 serving of MRS# 1317 Courtons (made) can be used instead of school made croutons. Nutrient analysis must be re-calculated. 1 serving of a Grilled Chicken Salad.